There is no doubt that Japan can be considered a mature market for the United Kingdom tourism industry. First visiting there in large numbers in the 1980s, the Japanese soon developed a love of the country and its brand, with many places becoming so popular they have been firmly established as “must see” destinations. “A golden route is Edinburgh, the Lake District, the Cotswolds and London”, Yuko Inoue of Kuoni Travel (Japan) Ltd. told BCCJ ACUMEN. Yet, not content with the familiarity of the Japanese–as well as of tourists from the rest of the world—with just some of the UK’s wonders, VisitBritain, the UK tourism board, has launched a new business-to-business event to showcase the best of the entire country. On 23 February, 10 Japan delegates from the travel trade, accompanied by VisitBritain Japan Manager Ashley Harvey and I, departed Japan for this two-day event. 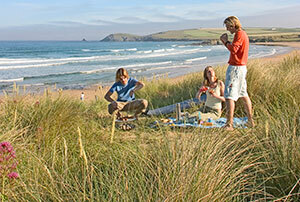 More tourists are visiting the beaches of Cornwall. Harvey said the visit is a very important way to enable the travel trade to experience the country first hand. “The feedback so far has been positive and we are keen to see new itineraries and ideas to inspire both first time and repeat travel to the UK”, he said. Held at Ascot Racecourse in Berkshire, ExploreGB connected 251 international buyers and 21 media representatives from 40 key markets with 320 British and Irish tourism firms. Designed to give businesses a route to market and help overseas trade sell the UK, the event featured pre-scheduled appointments, networking opportunities and a wide variety of British culinary fare. “We are focusing on the entire country”, said Sally Balcombe, chief executive of VisitBritain, at the inaugural event, adding that suppliers in attendance hailed from the length and breadth of the UK and included lots of smaller businesses. Following the event, delegates and media representatives went on familiarisation trips to destinations across England, Scotland, Wales and Northern Ireland. “It’s not just come and meet; it’s go and see, as well”, Balcombe said. While the UK was ranked 3rd overall as a nation brand in the Anholt 2014 Nation Brand Index—a survey of 50 countries which determines their perception of each other—Balcombe said there was more work to be done. During 2015–16, this will include further promotion of three pillars of the government’s multi-million pound GREAT campaign: culture, heritage and countryside. She is keen to focus on customer-led tourism and the segmentation of customers on a global basis, in order to deliver what they want. The aim is to attract 40mn visitors annually by 2020. Last year, the UK had its best year yet for inbound tourism, having welcomed 34.8mn visitors who spent £21.7bn. Secretary of State for Culture, Media and Sport Sajid Javid MP believes efforts to promote the whole of the UK through initiatives like the GREAT campaign, in connection with the legacy work of the London 2012 Olympic and Paralympic Games, is already bearing fruit. 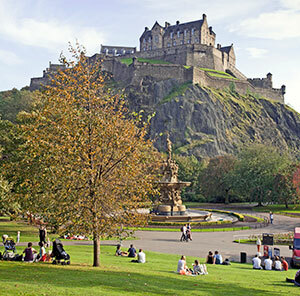 Edinburgh Castle is a top attraction. “Numbers [visiting the regions] have increased considerably, especially to Scotland, the Lake District and Cornwall”, he told BCCJ ACUMEN. “That’s very important, because London itself is a big magnet for tourists from around the world for lots of reasons—for our heritage, our history, our culture—and we want to make sure that people realise just what else Britain has to offer”. Citing the success of Stratford-upon-Avon in promoting its history and plays, rather than solely its location as the birthplace of William Shakespeare, Javid said: “What we have done in the UK is focus not just on marketing the destinations but also on the experiences of visiting certain areas”. Success is important; as one of the largest industries in Britain, tourism is currently worth £127bn annually. In 2013, it accounted for 9.6% of employment nationwide—3mn jobs—and is expected to support 3.7mn jobs by 2025. So what are Japanese visitors currently looking for in a trip to the UK? According to travel operator JTB’s online survey of women—56% of whom have never visited the UK and 44% of whom have visited once—83% of respondents cited sightseeing as their purpose, followed by 17% who said to enjoy fine food. Of those who chose sightseeing, many wanted to enjoy the atmosphere of places as well as see famous spots. Visiting film locations was also popular. 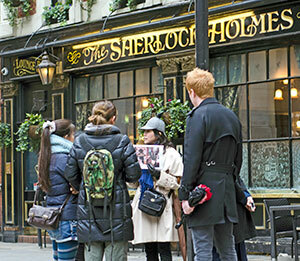 Japanese tour guide Miki Bartley explains the British character Sherlock Holmes. This interest seems to be a growing trend. According to VisitScotland, four in 10 travellers had been inspired to visit a destination because of having seen it on TV. Visitors to Rosslyn Chapel in East Lothian rose from some 28,000 in 2003 to over 176,000 in 2006 following The Da Vinci Code, while Glencoe in the Highlands, which can be seen in Skyfall, is now part of a James Bond tour. VisitScotland is now making film maps for various regions. Northern Ireland has also gained tourists keen to visit the sets of Game of Thrones in County Antrim and County Down, while tours around Cardiff in Wales, showing the locations of TV programmes Torchwood and Sherlock, are popular. This same trend can be seen in England, too. Speaking of the Culture is GREAT campaign planned for autumn 2015, Balcombe said, “We want to link culture not just to the classic arts and musical theatre, but film and TV as well. Work on film and TV tourism is something we see as a huge driver for the future. We have just seen the impact of certain films and certain TV programmes and we know that we are keen to do more”. Downton Abbey may be one such example that appeals to the Japanese market. Although the Japanese delegates—whose familiarisation trip included a visit to the drama’s filming locations of Cogges Manor and Bampton in the Cotswolds, England—were largely unfamiliar with it, interest is building, according to one UK firm. “For Japanese customers, our fastest growing product is Downton Abbey tours”, Jimmy Greene, director of International Friends, told BCCJ ACUMEN. “These locations are only 20 minutes away from the sites they have always loved, so adding this [tour] on, together with the popularity of Downton Abbey, is a fairly easy sell to that market”. Responding to requests from the US market, the firm’s tour was launched two years ago, with demand from the Japanese market beginning 12 months ago. Testament to the drama’s popularity, a presentation on Downton Abbey at VisitBritain’s “British Market” event—held to showcase food and goods from the UK—in Minato Ward on 18–19 April was fully booked. ExploreGB also provided an opportunity for me and other media representatives to visit Blenheim Palace, the birthplace of Sir Winston Churchill, former prime minister, and one of the most famous examples of the work of gardener Lancelot “Capability” Brown. Located in Woodstock, in the heart of the Cotswolds, Blenheim embodies what much of Japan’s travel trade say Japanese want to see in Britain: history, culture and gardens. Miki Bartley, a Blue Badge Tourist Guide—the official, professional tourist guides of the UK—says her most requested destination after London is the Cotswolds, including a visit to a manor house. In fact, such is the popularity of Blenheim Palace that two Japanese guides are available for tours when booked in advance, and resources are available in Japanese. Blenheim is expected to benefit further from an increase in visitors thanks to VisitBritain’s promotion of events and anniversaries related to key sites across the country. This year is the 50th anniversary of the death of Churchill, while the Year of the English Garden in 2016 coincides with the 300th anniversary of the birth of Brown, who created more than 170 gardens in Britain. Other anniversaries this year include the 125th anniversary of the birth of crime writer Agatha Christie, and 2016 marks the 150th anniversary of the birth of Beatrix Potter, who penned The Tale of Peter Rabbit. Birmingham has many modern buildings. The Japanese delegates said the most interesting and useful excursion of the trip had been a walking tour of Southbank, London, led by Bartley. Keen to show not only famous landmarks, but also the background and history of the area, Bartley provided information on famous people who once lived in the locality, such as Shakespeare, Geoffrey Chaucer and Charles Dickens, referencing the blue plaque scheme. Currently run by English Heritage, it is thought to be the oldest of its kind in the world, having been founded in 1866. Iconic British items, such as the pillar-box letter box, traditional phone box and double-decker bus were highlighted, as well as a local market, shared office space and communal garden. Many travel operators said visitors would appreciate this cultural information. An optional walking tour is attractive to their typical customer, namely couples in their sixties and seventies, and ladies in their thirties and forties, who want all-inclusive tours. Some operators added that, while more people in their twenties wish to travel independently, most opt for tours as they are unsure of where to go or what to do on arrival. 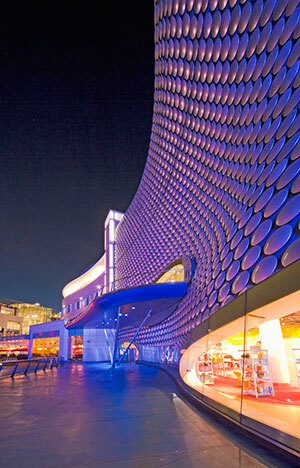 Similarly, delegates spoke highly of their experience in Birmingham, another destination on the trip. They took a guided walking tour of the canal network and historic jewellery quarter, before spending time in the centre looking at some of the city’s iconic buildings. Some expressed interest in the fact that Birmingham is home to the largest Christmas market in Britain, and at least one operator is making plans to create a tour incorporating this event. Through a joint campaign with Turkish Airlines planned in Tokyo this year to promote the Narita International Airport to Birmingham via Istanbul route, VisitBirmingham hopes to build on the city’s 12% increase in visitors over the past six years and welcome more visitors from Japan. Although enjoying fine food was ranked second in JTB’s online survey of women, there is a lack of awareness of the quality and variety of British cuisine. While delegates praised the dishes they ate during the trip, it is fair to say they were pleasantly surprised. “The image of English food is still limited in Japan”, said Inoue. VisitBritain is working hard to change that. Under the Food is GREAT campaign banner, the organisation promotes the gastronomic renaissance the nation has been experiencing over the past couple of decades. Among those endorsed are Michelin-starred restaurants and gastropubs, farmers’ markets and food festivals, as well as local, seasonal produce. It seems the message is getting through to consumers. Jill and Simon Coombe of Three Ways House Hotel—Home of the Pudding Club— in Mickleton, Gloucestershire, say their business has established a Japanese following, in part thanks to their traditional desserts. Simon has hosted club meetings in Japan, exhibited at the British Fair in Hankyu Department Store in Osaka and sold hundreds of puddings. “The Pudding Club is a big attraction; we still find it surprising what a sweet tooth the Japanese have”, Jill said, adding that guests love the pudding-theme bedrooms. In Japan, celebrity chef Gary Rhodes lent his expertise to VisitBritain for the “Rhodes Returns to Tokyo” event on 20–24 April, where seats to sample his fare sold out. Speaking of his last year’s offering of afternoon tea, Rhodes said “the response was incredible”. When guests told him they did not realise how good British cookery is, he encouraged them to visit Britain and see what it has to offer. “I think [the UK] has become recognised, certainly in Europe, as probably one of the best countries for food right now”, he told BCCJ ACUMEN. Certainly, the country’s reputation for “tea time” is well established. Also in the JTB survey, 44% of respondents said they most wanted to purchase tea in the UK, while 22% said sweets. 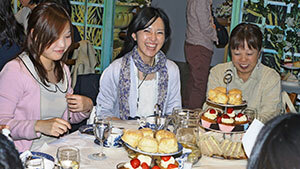 According to Bartley, having afternoon tea is one of the most popular activities for her Japanese customers. Recent publications of Japanese biweekly magazine for young women, Hanako, has included many highlights of London that cater for a sweet tooth. Meanwhile, BRUTUS, a biweekly publication tailored to men’s tastes, has featured a range of the city’s cafés and restaurants. In the spirit of learning from the success of London 2012, work is underway to use the Rugby World Cup (RWC) 2015 to promote tourism. Special packages will be offered with tour operators and others in Japan to give fans a chance to go to the UK. Japanese tourists enjoy afternoon tea in the Lake District. “We want to make sure that, when people visit Britain to watch the rugby games, they actually get to see different parts of the UK as well”, Javid told BCCJ ACUMEN. “We also hope that when [the RWC goes] to Japan in 2019, we can work for our mutual benefit: get people to come over to Britain [this year] for rugby, and then vice versa in 2019”. And, it is not just promotion of the UK that is set to have an impact on visitor numbers. Following the signing of a Memorandum of Understanding, the European Tourism Association and the Japan Association of Travel Agents are cooperating to lobby Tokyo to change the terms and conditions for travel groups from Japan. According to the current rules, Japanese groups are not required to pay anything until 30 days before their reserved trip, enabling them to make cancellations at a late stage. What is more, they have to be compensated a percentage of the entire package if they receive a room that is not of the standard they reserved. “The industry framework is now a hindrance rather than a help”, said Harvey, adding that hoteliers often charge more to protect themselves from these risks. He hopes for a relaxation of the terms and conditions that will make it easier for both hoteliers and the Japanese consumer. While VisitBritain is working to increase the numbers of tourists to the UK—provisional figure for 2014 about 214,000—the Japan National Tourism Organization reported 220,000 British visitors in 2014, a 14.7% increase on the previous year. Such was the success of ExploreGB that VisitBritain has decided it will be held again in spring 2016, in Liverpool. British Airways and partner Japan Airlines fly to London Heathrow three times a day from Tokyo Haneda and Narita.